Examining the Habsburg educational policy towards the Hungarian and Croatian nobility in the 1760s through the perspective of the Vienna Court the author analyses the Court's attempts to overcome conflicting interests of the traditional structures of the estates and the nascent proto-modern state. With the Habsburg Monarchy assuming control over education in the second half of the 18th century, tendencies began to appear focusing education on contents that favour the interests of the ruler's sovereignty and attempts to ‘politically discipline’ become a constituent part of teaching material. These tendencies became especially prominent in the reform of legal education through which relations between the ruler and the estates, between the state and its inhabitants as well as the rights and obligations of political subjects were defined, with emphasis on the meaning of public good, prosperity and necessities of time. The Vienna Court's education policy in the 1760s presented a turnabout in the history of legal education in Hungary and Croatia and a period of assertion of new educational standards for public servants. HORBEC, Ivana. 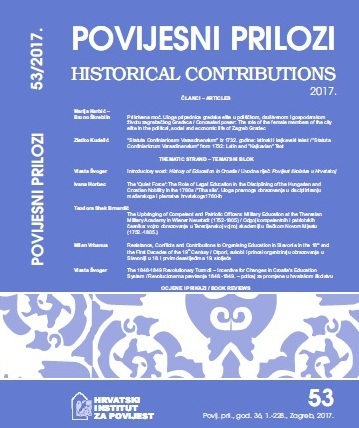 'The Quiet Force':The Role of Legal Education in the Disciplining of the Hungarian and Croatian Nobility in the 1760s. Povijesni prilozi, [S.l. ], v. 53, dec. 2017. ISSN 1848-9087. Available at: <http://pp.isp.hr/?journal=PP&page=article&op=view&path%5B%5D=25>. Date accessed: 21 apr. 2019. doi: https://doi.org/10.22586/pp.v53i2.25.